Deriving its name from Kao Liang which is grown in the north of China, made through unique solid-phase fermentation and distillation, and stored to mature. 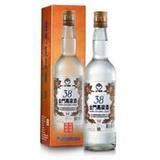 It is a type of Chinese traditional spirits, known for its strong taste around the world. Kinmen also uses the locally grown sorghum to produce Kao Liang Liquor.